I’ve never been too enamored with cooking magazines, other than perhaps Cooking Light, but I was offered a free subscription to Bon Appetit from Amazon.com a few months back, so I said what the heck. It’s alright so far, but I’m not overly impressed, and I haven’t gone out of my way to make any of the recipes. 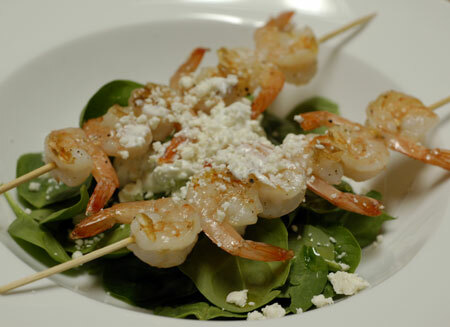 The other night we tried a recipe for shrimp skewers with tzatziki and spinach from the most recent issue. As I had hoped, it was a fast, tasty meal—hard to go wrong with those flavors, and most of the ingredients are ones I always have on hand. Not only that, but it made a lovely and fairly healthy plate of food. The problem came when we sat down to actually eat, though: it was impossible for us to eat this neatly. Of course Jeremy was eating over WoW, and Nolan was awake at the time, so I had to hold him with one arm and eat with the other. But there were the skewers and tails to deal with, and the tzatziki, while delicious, was too thick to scoop up easily either with a bite of shrimp or a forkful of spinach. I found myself wishing I had just removed the tails from the shrimp up front and sauteed them in a little oil and garlic, then tucked them in a pita with the spinach, feta and tzatziki. The portability and one-handed operation of a pocket sandwich would have been more than worth an extra trip to the grocery store or a few hours spent waiting for pita dough to rise. Considering all the other pluses to this recipe, it may happen yet. Incidentally, I couldn’t bear to toss out the leftover tzatziki, but had nothing to eat it with. So for lunch the next day, I mixed a can of tuna with a few tablespoons of strained tzatziki, a bit of mayo and some feta cheese. It made one of the best tuna sandwiches I’ve had in quite a while. Mix yogurt, cucumber, dill, lemon juice, garlic and shallot in small bowl; season generously with salt and pepper and chill until ready to serve. Prepare grill with oil. Thread shrimp equally onto 4 skewers and brush with olive oil; sprinkle with salt and pepper. Grill just until shrimp are opaque in the center, about 3 minutes per side. Divide spinach between 4 plates, and drizzle lightly with lemon juice and olive oil. Top each with one shrimp skewer, a dollop of tzatziki, and a sprinkle of feta. Source: Slightly adapted from Bon Appetit, August 2008 (p. 45)—and will be more firmly adapted next time.